NOTE: This is not an indictment or criticism of Coldwater Creek. This is such a powerful case of how a multichannel brand evolves that it warrants sharing. In the late 1990s, Coldwater Creek was a growing apparel brand, defying the best practice pundits by offering apparel in catalogs without the benefit of models. Sand Point, ID was the catalog apparel capital of the Pacific Northwest. Around the year 2000, Coldwater Creek caught the "multichannel bug". Take a peek at the image at the start of this post (source = 10K and 10Q statements from Coldwater Creek). Take a look at sales generated over the telephone, sales that are generated by the mailing of catalogs. After hitting $320 million in 1999, sales have dropped like a rock --- projected to land somewhere around $64 million dollars this year. Granted, catalogs circulated have dropped by more than a third, but by and large, the sales drop represents the death of the telephone channel, a channel completely cannibalized by the internet. The multichannel pundit would say, "Yabut, catalogs drive sales in all channels, do a matchback analysis dude". And the multichannel pundit is right. Look at online sales. Internet volume hit $142 million in 2001, then basically stalled for two or three years at a time when the rest of the world experienced wild online sales growth. Catalog mailings did not help the online channel, declining drastically during this time. 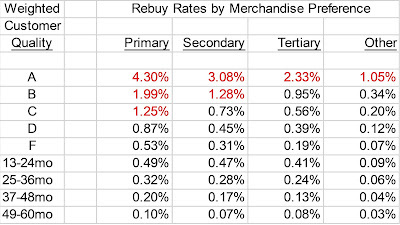 You can see that catalog expense dropped significantly at a time when retail sales were growing significantly. And then the bubble hit. It's easy to see the bubble, when looking in the rear view mirror. Take a look at the explosion in sales between the end of 2004 ($590 million) and the end of 2006 ($1.1 billion). WOW. Stores doubled, retail sales more than doubled, online sales increased sixty percent, with phone sales losing four percent. At the end of 2006, life is mostly good, though comp store sales are beginning to show signs of weakness. The stock price at the end of the fiscal year was at $25.00, down a bit from a high of $31.00. Store investment is a multi-year process. Through the view of the glasses we wore in 2006, it would make sense to continue to invest in new store openings. Grow baby grow!! And then the economy begins to crumble. It's hard to separate out the effects of the economy, and the impact of going from 114 stores at the end of 2004 to more than 350 stores today (some cannibalization?) --- but the combination of factors drubbed comp store sales. Declines of about twelve percent in 2007 (the 10K statements make it hard to calculate annual comps) are matched by declines of about sixteen percent this year --- and will likely get much worse once Q3/Q4 comps are added to the mix. In other words, over two years, same stores are generating almost 30% less business than they were two years ago, at the peak of the bubble. Allow me to state the fact another way ... if a store generated $2.5 million in sales in 2006, it is generating $1.8 million today. This is the failure of the retail model, the failure of the integrated multichannel brand. The management consultants and vendors and research organizations who promote all this "clicks and bricks" stuff haven't always had the benefit of working in a retail environment during an economic downturn. Once you've been blessed with that experience, you view the world in a different manner. In catalog marketing, if catalogs are failing, you quickly "flex" the business. You cut circulation and get profitable in a hurry --- hurting the top line but significantly improving the bottom line. In online marketing, you can mix up your website, you can dynamically change your e-mail marketing strategy, you can change your paid search strategy or portal advertising or affiliate program. You can be nimble. You change, you test, you react, you evolve --- quickly. In retail ... you commit to open stores in late 2006, based on sales projections from data in 2006 --- only to realize a distaster in late 2008. And you cannot easily get out of the stores --- stores have five or ten year leases that the brand has to honor. The Coldwater Creek of 2008 looks nothing like the Coldwater Creek of 1999. A single-channel catalog powerhouse became a huge retail brand with catalogs supporting a website that supports retail sales. If you want proof of this, take a look at the reductions in catalog and magazine advertising expense, and look at this quote from management in the most recent 10K statement. "Shift in Marketing Approach: Historically, we have used a broad based marketing strategy of national magazine advertising and catalog circulation, with television advertising on a test basis. We are now shifting to a more point of sale, in-store focus. Our efforts are focused on maintaining and better engaging our best customers, as well as attracting new customers through select advertising placement. We believe this more focused approach will result in a reduction in our spending in 2008 by approximately $35 million verses fiscal 2007. During the first half of fiscal 2008, marketing expense, primarily including national magazine advertising and catalog circulation, decreased approximately $22.6 million, as compared with the first half of fiscal 2007." When a brand evolves to a retail focus, it becomes critically important to cover the heavy fixed cost component of all retail stores. 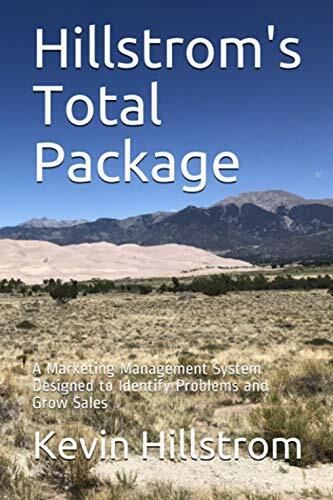 A catalog business flexes, an online business is nimble, a retail business is a beast that must be fed, or suffer dire consequences. Corporate employees began to face the dire consequences earlier this year, with more than sixty employees in the corporate office losing their job. Take a look at the share price of Coldwater Creek stock. Do you see a bubble here? 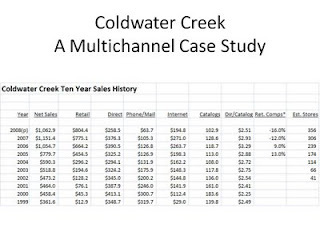 Coldwater Creek evolved from a profitable $362 million dollar catalog business with emerging channels in 1999 to a 2008 break-even billion dollar brand with most of the multichannel bells and whistles the pundits could ever ask for..
Use Coldwater Creek as a case study for the ages. Always remember that established channels lose ground to emerging channels during the growth stages of emerging channels. Always remember that direct mail advertising drives online and retail sales. Direct mail is "selfless" --- hated by many customers, but a selfless workhorse within a brand. Always remember that all forms of online marketing and digital marketing drive online and retail sales. Online and digital marketing support a retail channel. Always remember that retail is a selfish beast, a channel that needs to dominate, a channel that does not like to support other channels. Always remember to run profit and loss statements for new/existing stores, assuming that your business is twenty percent weaker than it is today --- if that happens, do you have a profitable retail business? Always remember that correlation does not equal causation. We exploded our multichannel opportunities during the rise of the bubble, diving into the "clicks and bricks" theory. At the peak of the bubble, the "multichannel" concept seemed great, with sales to support theories shared by pundits. Now ... not so great. Where are the pundits when the economy goes bad? A final question for you: Would Coldwater Creek have been better off being a profitable $400 million dollar catalog+online brand, or is Coldwater Creek better off being a break-even $1.1 billion dollar retail brand supported by a website and catalog advertising? This is a fantastic article! Of course, it's always easier, as you say, to look in the back mirror after the fact. But you've done a great job looking back at a real case. Oh yes, it is much easier to look back and see the trends in retrospect. Thanks for the nice comment. The challenges of moving to a retail business are compounded when you try to run that retail business in a mid 1990's style, with lots of television and mass media. The opportunity for bricks and clicks need to driven customers back and forth from the web to the store with full integration between them, like Best Buy has successfully achieved in the past couple years. Even then, as you said, "retail is a hungry beast..."
Hungry ... and selfish ... it doesn't like to refer customers to the web unless the customer promises to only research merchandise online but keep buying merchandise in the store! But isn't that a function of metrics? After all, in many organizations the metrics are retail sales and web sales (individually), not customer value, which is a more true measure of customer relationships. In addition, since customers view companies as one organization regardless of channel, a silo'd approach also leads to a fragmented customer experience and dissatisfaction/attrition. In most cases, sure, it is a function of metrics. There are times when my Multichannel Forensics projects highlight channel patterns that run counter to established best practices. Great case study approach to a range of retailers in the same bucket at the moment. It could reasonably apply to almost any company in the apparel industry at the moment. Everything they tried and did thru into 2007 sold just fine, so why not continue? Well, cause in mid-2007 people stopped buying clothes and no one knew they weren't going to start again. And they all did the multi-channel business plan, which until the same time period was working. So what happened that was unique to Coldwater Creek? First their catalog tactic to not use models to project image. Still have to create the need to buy so what they did use was some very powerful copy to create a quarterly romance novel. If you never read their catalogs (not a guy thing in the least) its quite a treat. It's also quite intimate for those shopping at home by themselves as normal. When the web was introduced an early clickstream analysis they did (I have done some work with them in the past) showed almost no shopping going on, the web was merely an ordering device. Not that the major of their catalog clients are women between the ages of 40 - 65 of middle incomes. Not an early web target. Moving to the stores they had another issue, their loyal catalog base was not taken with them. Same product, great merchandising, in good (expensive) locations. A younger shopper emerged that liked the stores, would never dream of looking at the catalog. So that younger shopper started looking to the web, which had never been developed for them. To your point doing multi-channel effectively means integration. But it also means shopper differentiation and merchandising. Coldwater Creek was doing a better than average job of that but not at all in the normal manner. They know each channel draws a different customer, however they are not very proactive about it. They have way too many stores for a company that is supposed to focused on a very clearly defined segment of the population. And they are an apparel company which means they have cycles of problems when they are not fashion right, which is a big problem today. Having worked for them from 2003 until this past July, I can say when it was good it was fantastic. As you may not know, today they layed off Assistant Store Manager in over half of their stores. The crumble continues!! Out of 348 stores 15 of them got to keep 2 assistant store managers. There were many jobs lost on the 9th! That's a lot of assistant managers.